Sailfest 2019 “Meet & Greet” took place at the pier Feb 4, with stand up tables, our own bar and lots of mingling! The Mayor welcomed everyone and thanked everyone on behalf of the children of Zihua. The children from Casa de Cultural and teenagers from Colegio del Bachilleres performed cultural dances which were colorful and fun. And there was a frame…. sorry maybe overkill… but everyone wanted to be behind it… till it broke… but it is on the mend!!! There was good food… and a big crowd… an overall success!!. 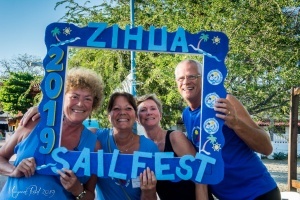 Thank you, Carol and the City of Zihua for a great start to Sailfest 2019!!. ← PreviousAnother fantasic Sailfest day – Rally Round the Rock!